The makers of FaceApp found themselves embroiled last week in what I’m obliged – by the confines of publishing nicety – to refer to as a “faecal cyclone”. The app enables users to doctor photos of themselves so that they can see what they would look like if they were older or of a different gender. It has been a huge success and sparked what has been described as a “viral face mashing trend”, a sentence that, even as I type it, makes me want to throw my computer in the bin after vomiting all over it. On Wednesday, users of the app found it had been updated to include new filters that allowed users to change their race to “Asian”, “Caucasian”, “Indian” or “black”. The reaction was swift, with users describing the filters as racist. They didn’t even have the decency to change the name to “Race App”. Come on guys, I can’t do all your work for you. Everyone knows people don’t mind racism if it’s delivered with wordplay. One can only assume their next idea is a “poverty” filter that enables rich people to see what their faces would look like if they fell on hard times, allowing them to laugh until they cry, before dabbing away the tears with tissues made of money. The features were quickly removed, but like opening a window after you’ve farted in a car, the damage was already done. This isn’t even their first brush with race-based controversy. Earlier this year, a feature that allowed users to see what they would look like if they were “hot” caused a stir after users found that it was lightening their skin tone. CEO Yaroslav Goncharov quickly apologised claiming, this was the result of a “training set bias” – meaning that the only images fed into it were white, causing the app to associate attractiveness with lighter skin. This news follows reports that artificially intelligent robots became xenophobic simply by absorbing culturally entrenched prejudices. Put simply, if Robocop were real he’d be racist. 1. Blackface is alive and well and still hanging out with its best pals Yellowface and Brownface. 2. Some prejudice is so ingrained it’s seeping into computers. 3. The Caucasian setting might be genuinely useful to people of colour. If we could trick people into thinking we’re white, we’d get paid more and be less likely to be stopped by the police. If Barack Obama had had this app he wouldn’t have spent the majority of his presidency waving his birth certificate in the face of a gameshow host with ideas above his station. 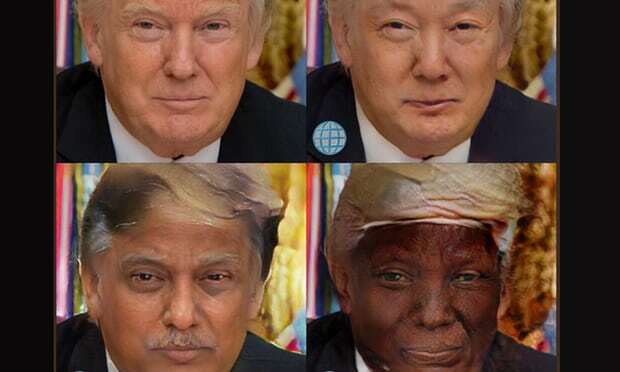 Until we face up or, at the very least, face app to these prejudices we are doomed to keep repeating them. In the meantime, I’m off to pitch Racist Robocop to Hollywood. In the current climate, it’s got to be box-office gold! Written by Nish for The Guardian on Sunday, August 13th, 2017. Fathers know best. Just look at Neymar’s dad So it’s Shakespeare out and Shaggy in at Cambridge?